1896 Restored Victorian located within steps to a lovely Bay Beach. Village restaurants, shops, NYC Hampton Jitney Express Bus and Shelter Island Ferry are all within a short stroll. Fresh produce farms, vineyards, hills and fields surround this very special place to rejuvenate your spirit and have fun. Fishing off the pier, sun bathing, swimming and people watching are all available within a two minute walk. Orient State Park is within a few miles and also offers nature lovers breath taking views of birds and marshes as well as the Long Island Sound. Also in Orient is a Sea Jet Ferry available to those who may want to enjoy the Mohegan Sun Casino in Connecticut across the Long Island Sound. Private and spacious accomodations for four adults include two bedrooms each with a separate living space and a fully equipped kitchen and bath decorated in a casual antique pine style. Our charming second floor apartment is peaceful, perfect for two couples or a family. Typical Day : Easy to rise in the morning and have a cup of coffee on the porch...take a stroll down to the beach and people watch.. come back..get ready for the day..
Leave the 'House'.. walk left toward the village and turn right on Clark Street ..now take a three block walk to the village along fourth street and the bay..enjoy the many restored village homes and the simple life..
My husband John and I both enjoyed busy careers for over thirty years in New York City.. John, good with all things mechanical worked both with his hands and in management in the electrical industry. I have always enjoyed understanding people ,art and nature. The Human Resources profession was my passion working with people and extraordinary companies in Fashion, Fine Jewelry, and Art. Together we enjoy making people happy..so here we are, hoping to meet interesting people and doing everything we can to help our guests enjoy their time in our home. John and I chose Greenport Village because of my love of antiques and wonderful 'unspoiled' older homes, while enjoying an innocent and simple quality of life in the Village. John's love of all things in or near the water.. boating, fishing, swimming... fresh seafood....The Long Island Sound and Peconic Bay made it a simple choice with countless activities to enjoy. Six village house away..end of road ..Beautiful Peconic Bay..
Our hosts, Maritza and John, treat us like guests in their home. They do all that they can to make us feel welcome and comfortable as well as give us great suggestions about the wonderful things that are available in the area. Our “apartment “, the second floor of their lovely home is charming, spacious and comfortable. There are 2 bedrooms and 2 living rooms which allows for a lot of privacy. The kitchen is attractive and well equipped. The house is a 3 minute walk to the beach and a 10 minute walk to town which has plenty of delicious restaurants and cute shops as well as a decent supermarket. Did I mention all the fabulous ice cream options!?! This was our second visit and we loved it and will be back. Thank you again for another terrific vacation! Maritza and John's place was perfect for my family and a couple of friends. They were very accommodating with everything we needed since we had our 11 month old son with us. Perfect layout if you have an infant/toddler and have another couple since there are 2 separate living room areas. The proximity to the beach was exactly as described and getting into town and the other wineries couldn't have been easier. We would stay there again in a heartbeat. This place was perfect for our girls trip. Four of us stayed in the top floor of this lovely home. John and Martiza were some of the nicest people we have ever met. Everything was clean. They provided so many thoughtful things like beach chairs and beach towels which made it easier to travel there. The front porch and backyard are both peaceful spots to sit and have your morning coffee :) The AC worked really well. The shower is tight quarters but it really didn’t bother any of us. I would highly recommend this place! The owners were lovely and our visit was fantastic. 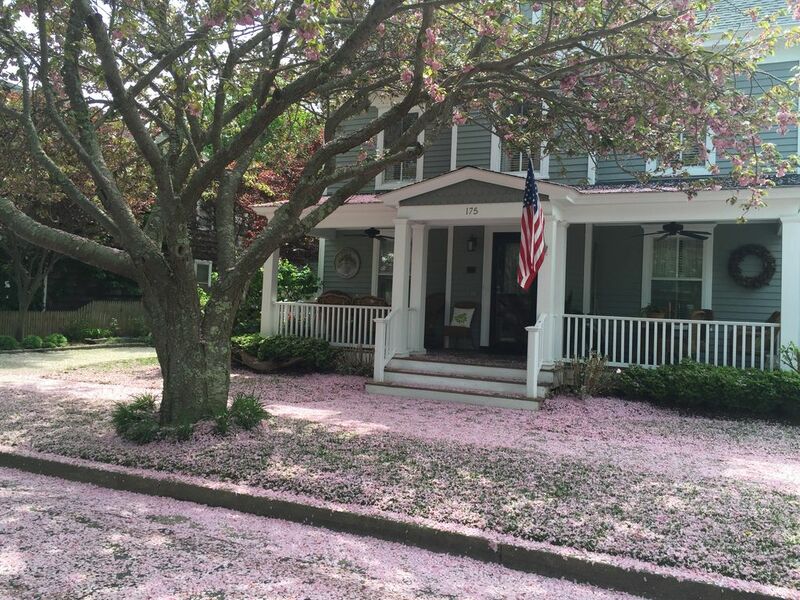 The property is lovely with stunning hydrangea flowers and the perfect front porch. A perfect getaway and we will be sure to return! My family and I thoroughly enjoyed our stay at the house. The owners provided everything you needed and more. It was a short walk to town where there were numerous choices to dine. We would definitely stay there again in the future. What an amazing spot! From the wonderful and warm hosts, Maritza & John (who we will miss until next time!) to the ideal location (1 block from the beach /park, 5 minute walk to town), to the beautiful space itself (huge, spacious and gorgeously decorated) this rental is just perfect. I can't wait to come back in the Fall! Well…You have just made our day! Thank you …so fun for our guests to enjoy our home and our Greenport! Hurry back…we miss you too. Greenport Village is a historic harbor front village with lovely restored homes, antique shops, art galleries, book shops, waterfront dining, antique carousel and more. The North Fork is also know as wine country with over thirty vineyards. Fresh farm stands are within a few miles to enjoy local fresh produce. Harvest season is also very popular for pumpkin picking and local events. Holiday weekend three night minimum Cancellations must be made 60 days prior to arrival..For refunds.